Orville noted in his diary on this Thursday in December 1903, that the wind was blowing steady between 20 and 25 mph. Orville kept meticulous notes about these things and he had long ago installed an anemometer and wind directional on their workstation at Kill Devil Hills, North Carolina. On this day in 1903 the wind was coming out of the northeast. Orville could feel the icy cold and quickly lit a fire in their stove to take the chill off the air and make some coffee. It was cold, but nothing like it could get back in Dayton. He looked outside and could see the puddles of water from yesterday’s hard rain had formed ice sheets glimmering across the flat sandy ground. The sky was mostly cloudy except for a narrow ribbon of sunlight to the west that colored everything with a pink salmon tinge for a few minutes until the clouds covered up the sun. Yesterday afternoon the brothers new that if the weather was right today, they would try the flight again. They were running out of time and they wanted to be back in Dayton for Christmas. At the beginning of this week, they had made their first powered attempt. They had set the track launch track up further south so they were going downhill for that first test flight. With the flip of a coin Lady Luck had chosen Wilbur for that first attempt even though Orville had more time flying the gliders. After Monday’s crash landing. Wilbur remained at the controls while Orville documented the damaged front elevator and broken skid after crashing from a height of 15′. On Monday’s attempt, Wilbur laid down across the wing with the two large wood propellers spinning just a few feet on either side of him. When everything sounded good, Wilbur gave the nod and the large noisy machine began sliding along the 60 feet wood rail with Orville running beside him to steady the wing. Just before the machine reached the end of the rail, Wilbur pulled hard on the elevator control. With the head wind and the momentum from going downhill, the machine lifted quickly to 15′ and stalled. It was a mistake and Wilbur new it right off. Wilbur tried to correct the situation by pushing the controls forward, bringing the machine back down but the angle was too steep and it crashed about 100′ from the end of the rail. Despite the extensive damage, the brothers were ecstatic. Everything had worked except for the landing. They had flown. It would take them 2 days to repair the damaged machine. This next time Orville would take the controls. 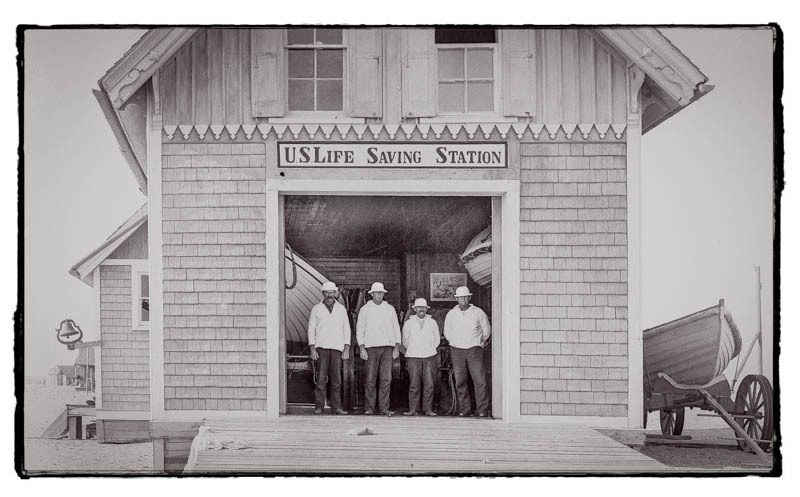 Photo taken most likely by Orville of the Life Saving Station at Kitty Hawk in 1902. These men were a great help to the brothers in moving their kites and the flyer out to the dunes for tests. After hanging a white bed sheet on the side of the shed, the brothers went about taking on all of the last minute details. The sheet was a signal that help was needed. For years, ever since the brothers had made their way to the Outer Banks of North Carolina, the brothers had relied on the men manning the Kill Devil Hills U.S. Living Saving Station, not far from the little sparsely populated Kitty Hawk. Only five men showed up. There was John T. Daniels, Adam Etheridge and Will Dough from the life saving station and W. C. Brinkley, a farmer and salvager from Manteo on Roanoke Island. Brinkley had seen the brothers the day before getting their machine ready to make another try. He doubted they would be successful, but he decided to stay and see them try. A teenager named Johnny Moore was also present. In fact he had been present for almost every test Wilbur and Orville had done since first coming to the Outer Banks back in 1900. There had been more visitors in previous attempts, but today was a particularly cold day with a stiff north wind blowing across the dunes. The brothers who grew up in Ohio were used to cold winter winds, but for folks living on the Outer Banks, today was bitter cold. This was exactly the weather the brothers wanted for their flight. In hindsight, Orville would later admit that it was foolishness that they tried to fly in that wind. But that’s what they did: FLY. Orville took the controls first. Wilbur had setup his 5×7 Korona 5 view camera on a tripod, focusing the lens on the end of the 60′ length of 2x4s bolted together to form a single rail that ran north by northeast. The sky had become even more overcast that created the perfect light to make a photograph. Wilbur asked John Daniels to squeeze the shutter bulb when the machine reached the end of the track. That single image which wouldn’t be developed until they arrived back in Dayton, but in time it would become one of the most reproduced photographs in history. 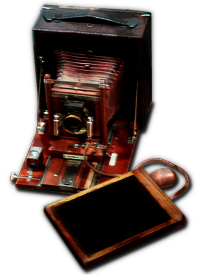 5×7 Korona 5 view camera used to photograph the Wright Brother’s flights. At 10:35 A.M. Orville let go of the rope holding the machine in place. It slowly began moving forward. Wilbur began running along the tip of the right wing. Orville would later respond when asked if he was scared, “…there wasn’t time.” Daniels took the photograph just as Wilbur stopped running. The machine erratic as it was, was airborne. It would remain airborne for a total of just 12 seconds just long enough to cover about 120 feet where it came back down safely sliding across the sand coming to a safe stop. The men picked the machine up and carried it back to the starting point then went back over to the shed to warm up. Less than a half hour later, they tried another flight. This time with Wilbur at the controls. Another successful flight this time going 175 feet. Then Orville tried a third flight and around noon Wilbur flew a fourth time reaching a distance of over 850 feet and remained in the air almost a full minute before landing safely. They again dragged their flying machine back, but the right skid had broken so they had to take it over to the shed where repairs could be made. They were talking about the best way to quickly repair the skid so they could get another flight in before the end of the day. That decision was taken out of their hands when a sudden gust of wind lifted up the machine and it started drifting across the sand. Orville shouted to grab it, and John Daniels flung his body onto the wing just as the machine flipped over entangling him in the wires and struts. The machine began flipping end over end. Johnny Moore would later say that he feared the plane was going to roll all the way over to the beach. But the sudden gust of wind stopped and the machine came to a rest. Although Daniel was extremely bruised and scratched up, there was nothing broken. He survived. However, it would be the last time the original flying machine would take anyone off the ground. SUCCESS FOUR FLIGHTS THURSDAY MORNING ALL AGAINST TWENTY MILE WIND STARTED FROM LEVEL WITH ENGINE POWER ALONE AVERAGE SPEED THROUGH AIR THIRTY ONE MILES LONGEST 57 SECONDS INFORM PRESS HOME FOR CHRISTMAS. Resources: “The Wright Brothers” by David McCullough, Library of Congress images, the Carillon Historical Park, Dayton, Ohio and Johnny Moore’s diaries. Kill Devil Hills as it looked in 2006 with the original 1903 photograph superimposed. 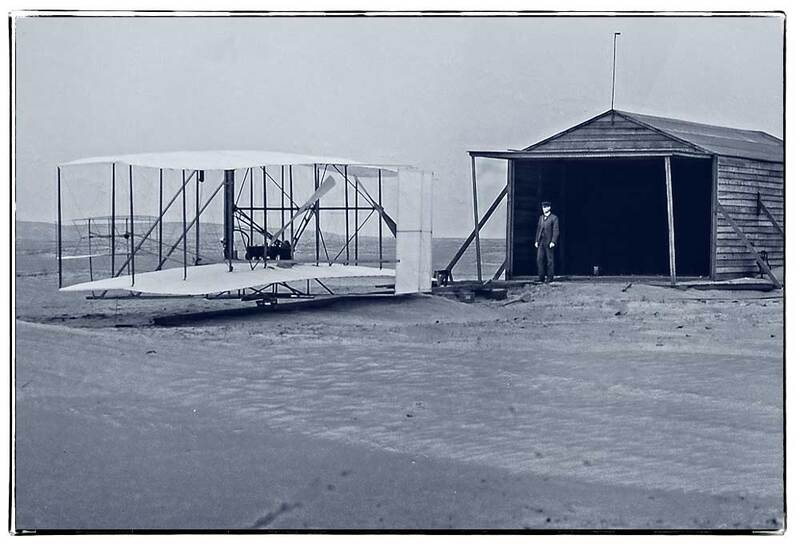 Most everyone knows that on December 17, 1903 the Wright brothers flew a heavier than air machine for the first time at Kitty Hawk. Most people however, don’t realize all the details that immediately led up to that event. The road to Kitty Hawk began on this day, September 18, 1903 at the Dayton railroad station. It took a good bit of time to pack their new flying machine, making sure all of the wood struts, ribs, guy wires, enough muslin material to cover all the machines surfaces, and of course the new engine. Everything the brothers would need to completely assemble the flying machine among the sand dunes of Kill Devil Hills on the outer banks of North Carolina. Once they arrived here there would be no machine shop where they could quickly repair a broken rod or re-thread a bolt, even getting a piece of lumber requiring an extended trip by boat across the bay. Up to that point, their flying machine had never been assembled– it was too large for their machine and bike shop. They did assemble the center section, but even that took up so much room in the shop, that it became almost impossible for them to work on the machine and wait on bicycle customers. Orville and Wilbur Wright packed their new “whopper flying machine” as they called it, into crates they estimated to weigh around 675 pounds (all assembled the flying machine would weigh 750 pounds). It was a lot of weight to be lifted into the air by their little 4-cylinder cast aluminum engine of their own design. The engine block had been cast for them, but everything else they machined and fitted themselves, an amazing accomplishment in itself since neither brother had any experience even working on a gasoline engine. Once they successfully completed and tested their new engine, work shifted to the final phase before heading to Kitty Hawk: make the propellers. The brothers spent much time working out the intricate details of building a propeller that could actually move their flying machine forward. Like many of the things the brothers were doing, building a proper propeller had not yet been successfully accomplished and everything they could read about the subject, went against the information they had obtained from their tests. In the end they decided they needed two 8.5 foot propellers made from laminated spruce. Five years later almost to the day a similar wood propeller would shatter during a test flight at Fort Myer and cause the plane to crash into the ground head first killing passenger Lieutenant Thomas Selfridge and seriously injuring Orville. But on this day in 1903, the brothers were confident but careful. They had conducted all the tests they could imagine and they believed they were ready. It was the beginning of a trip that began many years before and they were now on the verge of reaching that first major stop along that journey that would consume the rest of their lives. Over the past 3 years Wilbur and his younger brother Orville had made the long train ride to Elizabeth City 3 times. Usually, Wilbur accompanied the crates, but this year the crates were traveling without him. They would be waiting in a warehouse in Elizabeth City when both brothers arrived less than a week later. Once in Elizabeth City, the brothers checked on their crates. From Elizabeth City they sailed down the Pasquotank River then across the Albernarle Sound to Kitty Hawk. It was a little less than 40 miles, but could be a harrowing trip depending on the weather. On Wilbur’s first trip to Kitty Hawk in 1900, the 40 mile trip took 2 days when a storm slashed the sails on the rickety sailing sloop Wilbur had hired to get him and his crates over to Kitty Hawk. Wilbur spent most of that first night bailing water from the ship just to help keep it from sinking. This year the weather was better and the trip over to Kitty Hawk less harrowing. Wright glider descending from Big Hill. 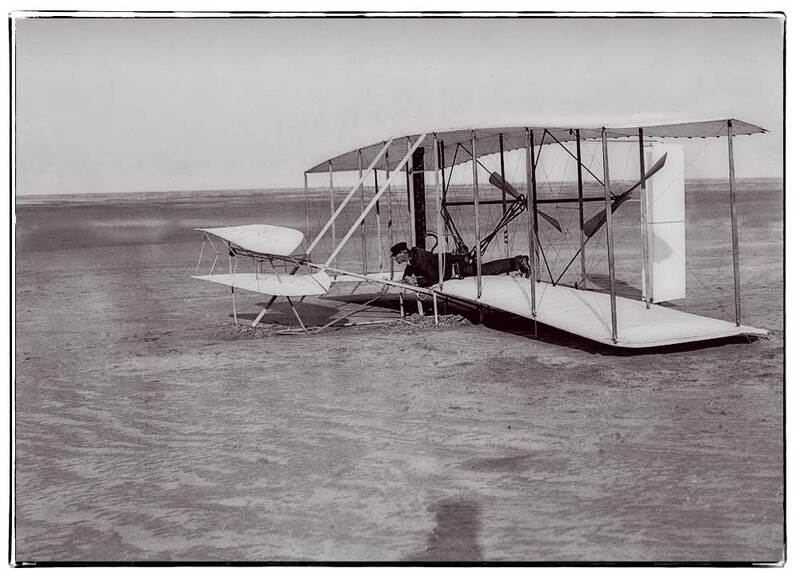 One of four photographs of gliding activities taken on October 27, 1903, when Wilbur and Orville each made two glides. 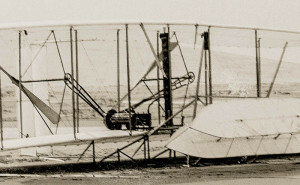 When the brothers arrived in Kitty Hawk in September 1903, they found storms from the previous year had caused some damage to their shed–it had been moved several feet from where it had been the previous year, but the glider they left inside was in good shape and quickly prepared for some more flying. When the weather took a turn for the better, a perfect day for gliding, they dragged the glider up to the big sand hill. Here they took 30 – 40 glides with one of those lasting 43 seconds and traveling 450 feet. After these glides, the brothers were refreshed and ready for what lay before them: assembling their new flying machine. It would take about almost a month before the frames were properly assembled. On November 2 they began the delicate work of placing the engine on their machine. While work continued on mounting the engine they found the shafts for the chain sprockets needed to be changed. Those shafts had to be sent back to Dayton for repairs where Charlie Taylor, their machinist, could make repairs. As the October came and went, the brothers worked diligently. Good friend, engineer and aviation pioneer, 71 year old Oscar Chanute made his way out to the Kill Devil Hills. He wanted to see what the brothers had accomplished since they last talked. Oscar studied what they had put together so far, but wasn’t convinced it would be good enough to get them aloft. Somewhat disappointed, Oscar left after visiting for two days. The brothers continued on assembling their flying machine. 1903 machine and large camp building where it was housed at Kill Devil Hills– photograph created Nov. 24, 1903. Toward the end of November the new drive shafts arrived from Dayton. During some initial testing the new shafts cracked. Orville decided to go back to Dayton and make the new shafts himself. He left on November 30. Orville would not be back until Friday, December 11. Glad to see Orville again, the brothers began making the final adjustments through Saturday. On Sunday as was their normal routine, the brothers did no work. On Monday, December 14, everything was ready for their first test flight. After a coin flip it was decided that Wilbur would make the first flight. With everything set, the engine was started. Gliding down the rail the machine lifted when Wilbur pulled back on the rudder causing the plane to rise too quickly and it lost momentum and began to stall. Wilbur then over corrected bringing it back down and crashing into the sand. Wilbur posing on damaged machine after unsuccessful trial of December 14, 1903; Kill Devil Hills, North Carolina. The damaged can be seen immediately in front of Wilbur. Shadow at bottom is that of Orville taking photograph. He took 2 different exposures. What could have been a catastrophic event was met with cheers. It had worked! The motor, the rail, the propellers, everything worked– it was just the pilot that needed some adjustment. Damage to the machine was minor but it would take a little time to fix. On Wednesday afternoon all was set and it was decided the following day they would try once more, but this time Orville would try his hand at the controls. Confident they had everything under control, the following day, Thursday, December 17, 1903 would certainly be a day worth remembering. For Katherine Wright, a school teacher at Dayton’s Steele High School and the younger sister of the Wright brothers, it was a normal day. By now she was used to her older brothers being away from the house they all shared with their father. More recently the local papers had been trying to get her to comment on Wilbur’s accomplishments in France. Her brothers had become rock stars in Dayton, but it was still unnerving for her to receive a telegram about one of them. 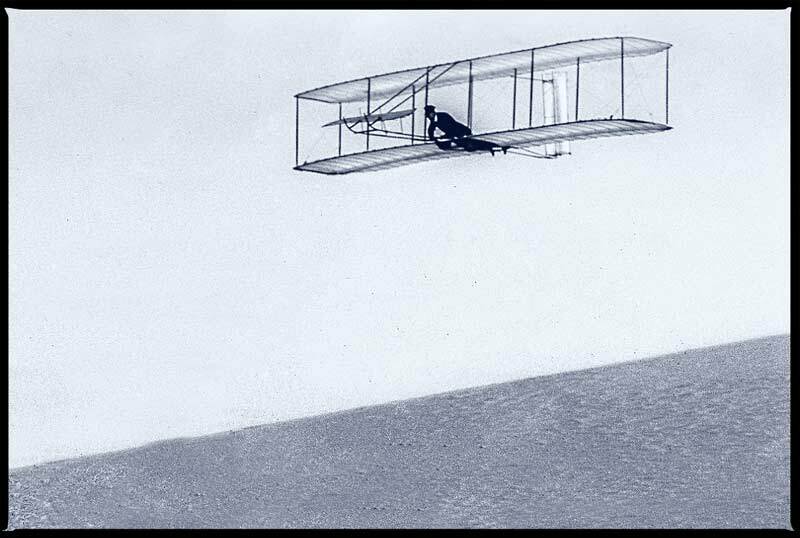 It had been almost 5 years since the Wright brothers had proven to themselves powered flight was possible. Since then they had been steadfastly improving their flying machine and now they were out to show a doubting world that they could fly. 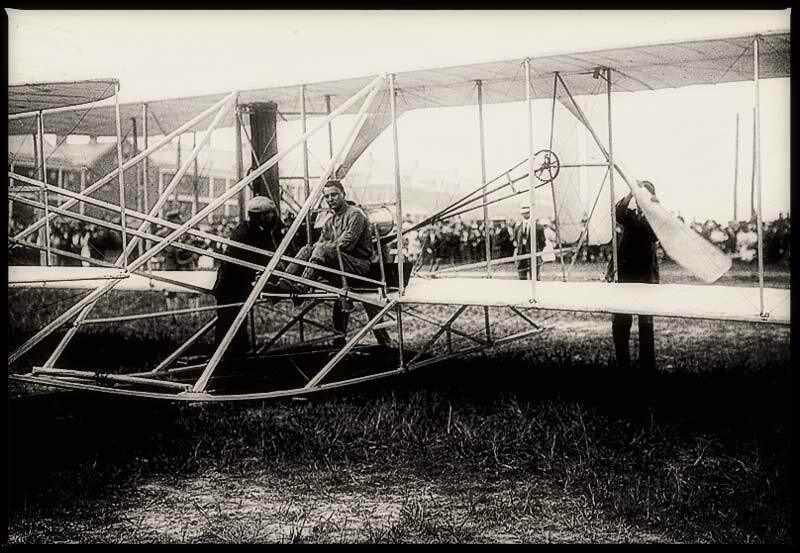 Wilbur Wright had one of their flying machines in France where he had been conducting almost daily flights before spectators that were arriving by the 1000s to observe how his flying machine could take-off, fly circles and figure 8s then safely land. He had become the iconic fearless American adventurer and entrepreneur. Back in the United States, his younger brother Orville was doing what he could to prove to the United States military, that what he and his brother had built could be useful for the army. That meant Orville had to go through a series of tests devised by the military before they would award a contract to buy the brothers’ flying machine. To this point the government had actually gone out of their way not to believe the two brothers without any government help, had built a flying machine unlike any other. However, the Wright brothers finally got permission to demonstrate one of their flying machines for the US Army Signal Corps at Fort Myer. The first test flight on September 3 ended with a modest crash landing. Orville was bruised slightly, and the plane received some damage, but nothing that couldn’t be fixed in short order. The following day the plane was again ready to fly and so was Orville. This time everything went as planned. It was the beginning of a series of flights that suddenly grabbed the attention of the American public when accounts of the secret test flights became known. Suddenly it was no longer a few dozen spectators watching Orville, but a few thousand that waited often days to see what the young inventor would do with his flying machine. On September 10, Orville kept his machine in the air for over an hour. The next day members of congress ventured across the Potomac River to see for themselves what all the talk was about. On this day Orville exceeded his previous record from the day before. The following day another record was set. 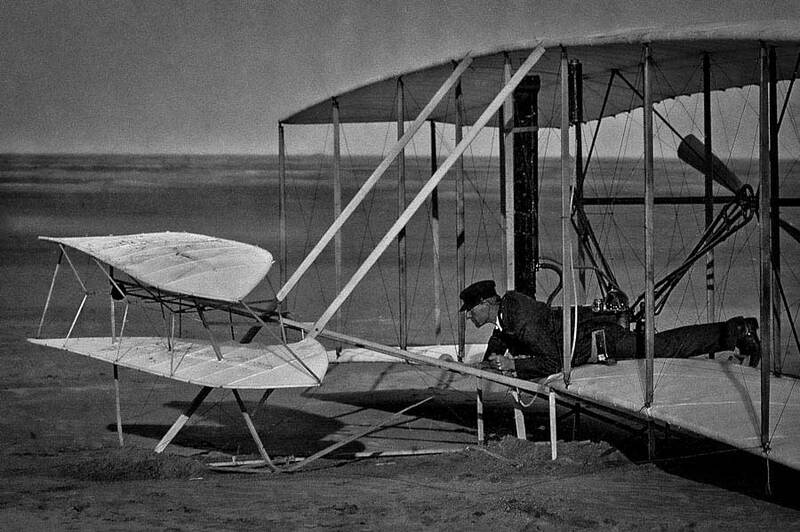 Orville Wright became a household name around the world. The test flights continued and the crowds grew even larger. On this day, Thursday, September 17 the conditions were almost perfect. Orville had already taken up several passengers in the preceding days. Today he would do the same. 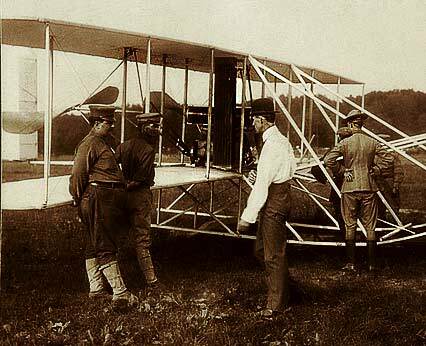 Orville Wright preparing to take his seat alongside Lieutenant Selfridge already seated for their test flight at Fort Myer. The propeller on the right is the one that splinters causing the fatal crash. Lieutenant Thomas Selfridge who had also been designing both lighter than air dirigibles and heavier than air craft wanted to go aloft with Orville to see for himself how this flying machine handled (Selfridge’s craft he had designed had crashed earlier that spring). 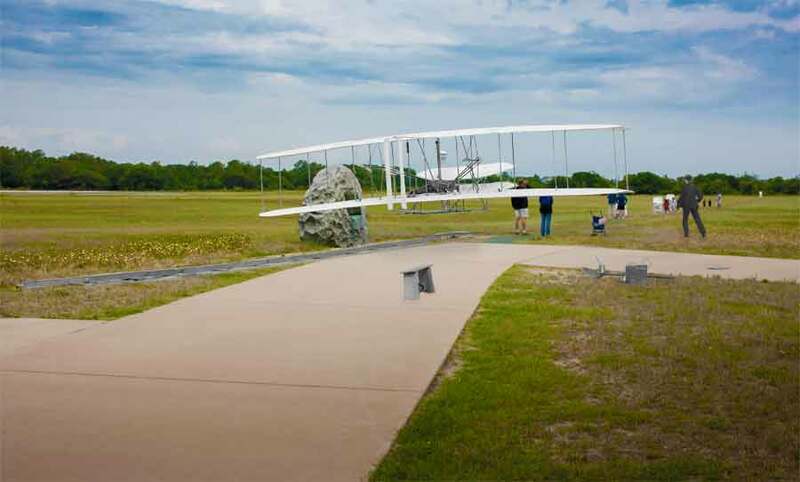 The flying machine lifted off the ground at 5:14 P.M., but the Wright’s machinists noticed the plane did not rise as quickly from the ground as it had on previous two-manned flights. They would later find that the lieutenant weighed 175 pounds, much more than any of the other co-pilots that flew in the previous flights. This additional weight was perhaps enough to cause more strain on the engine and the spruce propellers. There was also a 6 mph headwind. Once airborne, the flight appeared to be going as expected. Orville and Thomas Selfridge successfully completed three wide circles to the cheers from the large crowd below them. On the fourth, one of the mechanics noticed something fall from the plane. Just before that, Orville turned to look back. There had been a slight thump but he couldn’t see anything amiss. Not wanting to take any unnecessary risks, Orville slowed the engine and began a descent to land. Just as he began the descent, there were two loud thumps and the machine quickly began vibrating. Orville turned the engine off and tried to make a glide landing, something he was familiar with. However, Orville not fully realizing all that had just happened wasn’t aware that the left propeller had literally exploded and sheered off part of the strut making the machine unable to be controlled. This was the first time those particular propellers were used. No matter how hard Orville pulled the levers, the machine did not respond. It suddenly turned to the right and then dove directly toward the ground. Both Orville and Thomas were thrown forward from their seats with parts of the flying machine crashing around them. 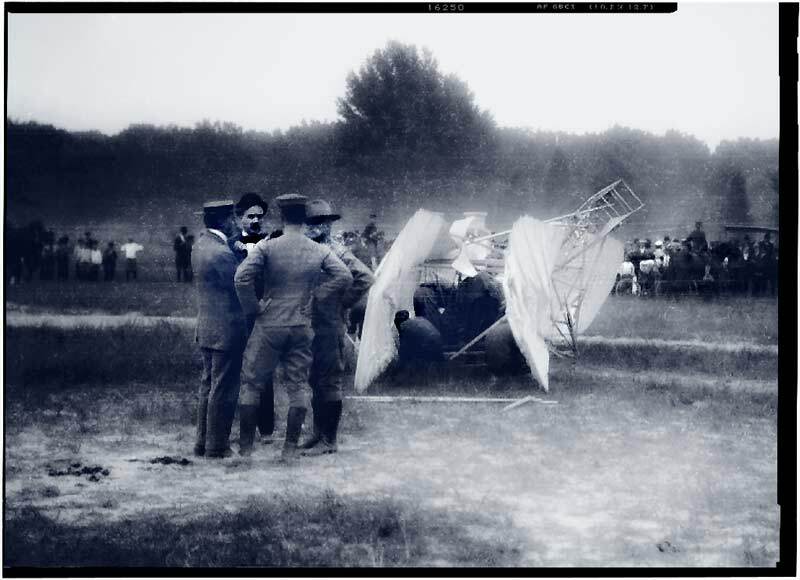 The crashed flying machine at Fort Myer. Orville and Lieutenant Selfridge have already been removed from the crash site and taken to the fort’s infirmary. Mounted soldiers tried to keep the crowd back and away from the wreckage that was leaking gasoline from the punctured fuel tank. Lieutenant Thomas Selfridge was unconscious and Orville was semi-conscious. A doctor at the field said both men were in critical condition as they were removed by stretcher and taken to the Fort Myer infirmary at the other end of the field. Without ever regaining consciousness, Lieutenant Selfridge died that evening. When Orville regained consciousness in the hospital, he dictated a telegram that was to be sent both to his brother Wilbur in Le Mans France, and his sister Katherine. He wanted to assure them that he was alive. Orville Wright remained in serious condition for the next week. When Katherine received the telegram she immediately contacted the Steele High School principal that she would need to take an extended leave of absence. Katherine arrived two days at Fort Myer and would remain with him until he was well enough to make the train ride back to Dayton in November. On this day in 1908, Lieutenant Thomas Selfridge became the first person to die in a crash of a powered airplane. After this accident, the Army insisted all test pilots where helmets which would most likely have saved Selfridge’s life in this particular accident. When Wilbur Wright was notified of Orville’s accident, he stopped flying for a few days and then decided to continue his test flights in France, but instead of having a passenger, he flew with a sack of sand as his co-pilot.